I’ve got a bearish Aussie bias and I’m still a bit bummed out that I wasn’t able to catch more pips on my earlier short AUD/JPY play. 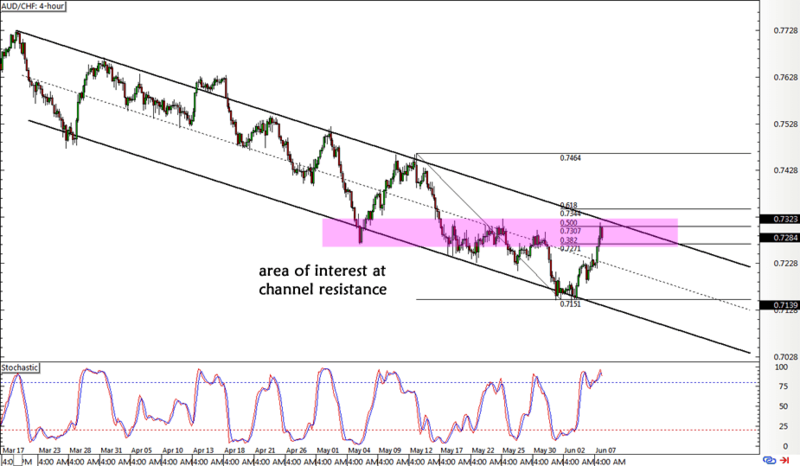 However, I’m seeing another potential channel setup on AUD/CHF and it’s looking pretty neat with plenty of resistance levels lining up. Price is currently testing the 50% Fib, which coincides with the .7300 major psychological level and a former support zone. This is around the channel resistance, too! At the same time, stochastic is already hovering around the overbought zone, which signals that Aussie bears are ready to get back in the game. However, I’m hesitating to hop in at market because Australia just printed a stronger than expected Q1 GDP reading of 0.3% versus the 0.2% consensus. This follows a relatively confident RBA statement in which policymakers shrugged off recent signs of a slowdown. Iron ore prices have also popped higher at the start of the week, which has also been bullish for the positively-correlated Aussie. This has been due mostly to restocking activity, though, so I’m thinking the business slowdown in China could still weigh on commodity demand and prices down the line. There has also been talk of potential SNB intervention, but it looks like those speculations have subsided after the Swiss foreign currency reserves report actually printed a decline instead of a buildup. Besides, it looks like the franc could retake its spot as the safe-haven of choice in Europe with the U.K. elections doing a number on GBP and a potentially downbeat ECB statement dragging the shared currency down. Short AUD/CHF at .7275, stop loss at .7425, initial profit target at .7075. I’ll be ready to move my stop to entry once price tests the previous lows at .7150.